We've been dealing with an almost embarrassingly strong winter box office season so far, both in terms of the number of hits and what films are hitting, acting almost like an early spring. We don't quite have the quantity this weekend, but the box office gravy train should keep going for at least one more weekend. Tyler Perry is not a man who worries about overexposure. 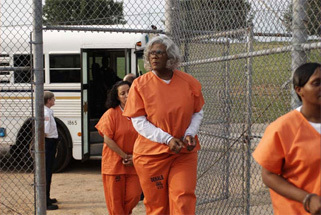 Madea Goes to Jail is the fourth film directly in the Madea series since 2005, and the seventh film to make it to theatres either directed by him or based on one of his plays. Essentially all but one, Daddy's Little Girls, have been hits, so it's hard to fault him for continuing to throw these films out there, though I think I must have missed Madea Goes to Camp and Slam Dunk Madea, though I may be thinking of another series. These films pretty much defy criticism or analysis, so it's basically to the point of noting that it's out there, and until further notice penciling them in for somewhere in the mid-20s, let's say, oh, $24 million. These films are just about as reliable a cash cow as the Saw films. The other major release of the weekend is the largely disposable teen comedy Fired Up!, starring Eric Christian Olsen and Nicolas D'Agosto as high school football players (they're 31 and 28 respectively – time to call your agents, guys) who skip their camp to go to cheerleading camp, mostly to get girls. While I applaud their officer thinking, it's not a lot to build a movie around. There's some business in here about rival cheerleading squads and being true yourself and yada yada yada, but it really boils down to it being Bring it On with people you haven't really heard of in place of Kirsten Dunst. Female lead Sarah Roemer, notably from Disturbia, could have break out potential, but this isn't a film that feels like it has much going for it. It's basically horndogs only for this one, and on under 2,000 screens, it feels like a bit of a dump. Give it $6 million for the weekend.